Influenced by traditional wood block printing, Irezumi (Japanese-style tattooing) is regarded as folk art like ceramic making or landscape painting. Japanese tattoos are usually made with red and blue natural dyes and often cover the whole body. The elaborate designs often include auspicious symbols, animals, Buddhist deities, or characters from folk tales. Getting a tattoo in Japan is very expensive and painful, involving pricks and pokes and blood. Hand-tattooing is done with natural colors and tools such as chisels. Machine-fired electric needles are faster and use aniline dyes to produce more intense colors . Photographer Felan, creator of the book Japanese Tattoo, describes the appeal of tattoos as "the glorification of the flesh as a means of spirituality," "power bestowed at the price of submission," and "beauty created through brutal means." Tattooing has a long history in Japan. Tattooed clay figures from the Jomon period (10,000 B.C. to A.D. 300) have been unearthed. Chinese texts from the A.D. 3rd century mention Japanese tattooing. Native Ainu women wore Tattoo mustaches as a sign of virtue. In feudal times, authorities tattooed criminals so they could be stigmatized by the rest of society. Repeat offenders were given had Chinese characters marked their foreheads that described their crimes. Over the years, outlaw types took pride in these markings as a sign of irreverence and rebellion. In the Edo period workers in certain professions began wearing a tattoo of their guild mark. In the early 1800s, firemen began the fashion of wearing full body tattoos. If a fireman died in a fire the tattoos helped identify him. The practice was later adopted by gamblers, laborers, sushi chefs and members of the yakuza. Getting tattoos was viewed as a rite of initiation to an exclusive group. Many sushi chefs today have a guild tattoo. 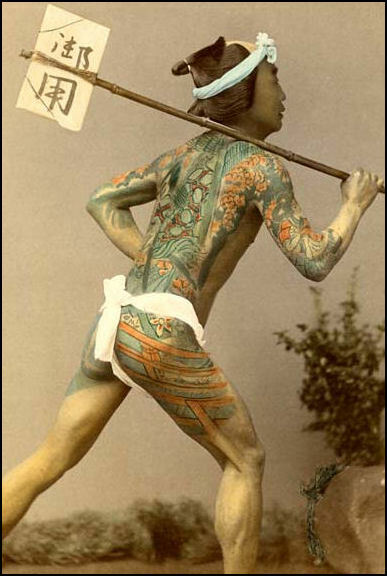 Tattooing was banned in 1872 in the Meiji period as a primitive and backward practice. The ban was not lifted until 1948. Even so in the late 19th century many sailors got tattoos while stopping in Japanese ports. King George V of England became an admirer of the art form when he was a sailor and had a dragon tattooed on his arm there in 1881. Among some other famous people said to have gotten Japanese tattoos were Russia’s Czar Nicholas II, Queen Olga of Greece and Winston Churchill’s mother. People with full body tattoos are called horimono. 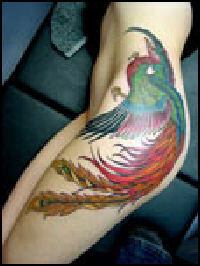 A body tattoo can cost several tens of thousands of dollars and take years to complete even with biweekly sessions. The designs cover the back, buttocks, and upper leg and are made so that they are kept secret and only revealed when the horimono removes his clothes. Designs on the chest and upper arms are limited so the wearer can unbutton his shirt and roll up his sleeves without revealing his tattoos. Full body tattoos reportedly began as a way for criminals to hide their criminal brands. The practice was picked up by elite samurai in the 18th century. Full body tattoos are usually made with a particular theme and are influenced by centuries-old Chinese folktales and stories from kabuki and noh theater. Artists often discreetly sign their works. Tattoos artist generally begin in the middle of the back and expand outward in postcard size blocks. The pain is intense during the sessions, enough to cause nausea and fainting, and can linger for days afterwards. Getting tattoos on the stomach and lower back are particularly painful. Quietly enduring the pain is part of the ritual. The pain helps establish a bond between the customer and the tattoo artist. There is a tradition of the horimono remaining in touch with the tattoo artist his entire life and seeking them out on occasion for advise on personal matter. Horimono periodically get together for meeting and opportunities to show off their tattoos to one another. People with tattoo masterpieces sometimes donate their skin to university museums in their wills. Tokyo University reportedly has a collection of 300 framed tattooed skins. Some yakuza members have body tattoos with dragons, carp, Chinese goddesses, and mythic characters of strength. The tattoos are usually located on the backs, shoulders and upper arms, places hidden by clothing. Often the only place where people see the tattoos is at public baths. Most ordinary Japanese avoid tattoos because of their association with the yakuza and gangsters. People with full body tattoos are often prohibited from entering public baths. Horimono say these associations are unfair. Yes, they say, there is certain amount of machoness associated with full body tattoos and some gangsters have them, but a direct connection between the two comes from formulaic gangster films. Because tattoos are associated with the yakuza tattoo artists are sometimes called on by police to help solve crimes. Some yakuza members are spending $25,000 to have their tattoos removed with lasers. One plastic surgeon told the Los Angeles Times, he treated 70 to 80 former yakuza between 1992 and 1997. The majority of those who sought treatment, he said, were gangsters in their 20s and 50s who wanted out of the yakuza. Some mistresses of yakuza bosses have much of their body covered with tattoos from yakuza mythology.